Visit Chernobyl without leaving home! Chernobyl VR Project is a unique project developed by The Farm 51, as it combines video games with educational and movie narrative software. Visit Chernobyl without leaving home! Chernobyl VR Project is a unique project developed by The Farm 51, as it combines video games with educational and movie narrative software. 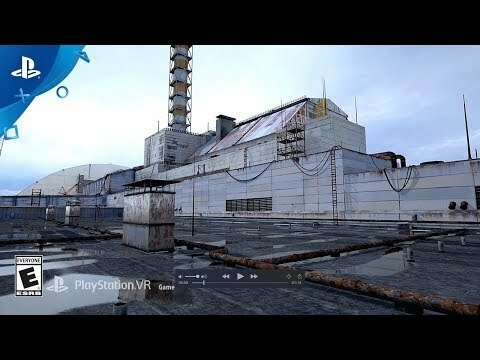 It is the very first virtual tour around the Chernobyl and Pripyat area, compatible with PlayStation®VR headset. Now with PlayStation® exclusive content – the roof area nearby The Ark sarcophagus. Find out more about the nuclear disaster’s history and today’s exploration of the contaminated zone. Walk around beautifully scanned 3D locations and explore the stories scattered all around the area and find yourself in places you would have never imagined yourself being in. Now you have the chance to walk on the top of the Moscow Eye, a 150-meter-high old Soviet radar, or the control room and the roof of the Chernobyl Power Plant and other places from the restricted area. Along the trip there is a guide who tells you about the places you visit. About emotions, childhood memories and real tragedies. About the times when the city was full of life. You will be able to listen to interviews with the Nobel Prize winner Svetlana Alexievich; the legendary boxer Vitali Klitschko, now the Mayor of Kiev; and other people whose lives were affected by the nuclear disaster. Chernobyl VR Project © The Farm 51 Group SA, Poland. All rights reserved.